There were two of them sitting in a tree, like sentinels, and they were making these “purring” sounds. I hadn’t heard them before. Then they started to make these “popping” sounds also new to me. I watched as they arched slightly backwards to make the low “popping” sound. It’s almost as though their tone or voice dropped lower in order to make the “popping” sound. 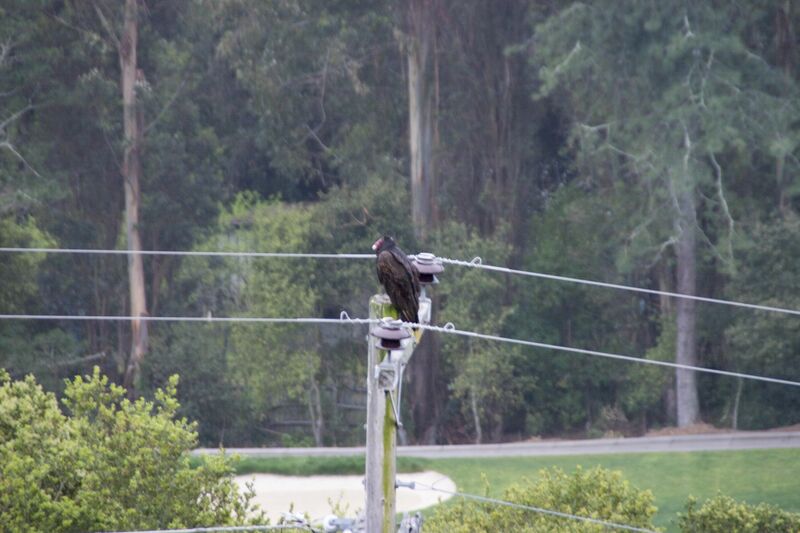 I was struck by the uniqueness of the vocalization and that they looked like two sentinels on either branch of an oak tree. I stopped to take my camera out, go figure they flew away. “Well I guess I needed to be in the moment with them,” I thought to myself and off we trudged, although my footsteps were a little lighter and my head a little less full. 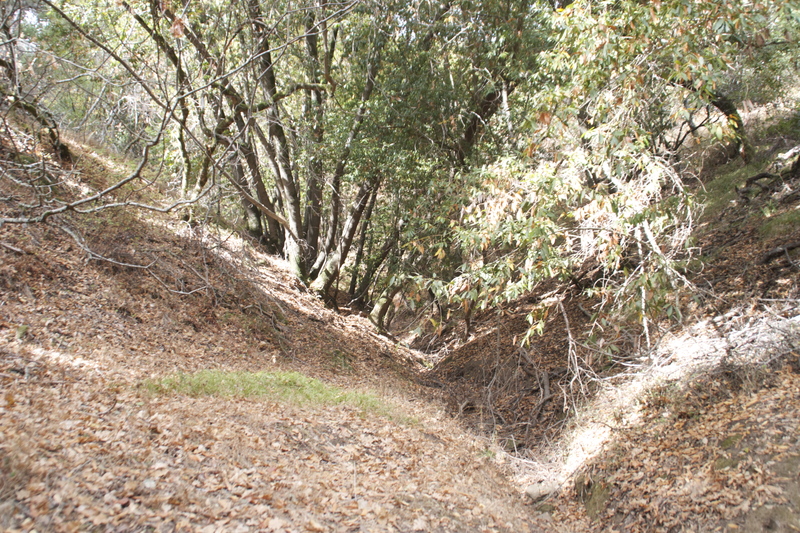 As we approached the second climb I heard the golden dry grass humming. I wasn’t sure if they were crickets all chirping at once, but something in that steady “hummm” calmed me, it was almost like a chorus of dry golden grass and crickets humming or toning together. The sky was this brilliant blue and the last of my heaviness and mental busy-ness dropped away. As we rounded the bend two ravens flew over us, “cawed” and landed on the Red Rock! I was totally awed, and full of wonder and joy! Despite feeling the urge to push myself to work I listened to Magik, listened when I found the smaller red rock, and listened when I saw the ravens. I and others call it listening to the “whispers”. I’m so glad I listened. 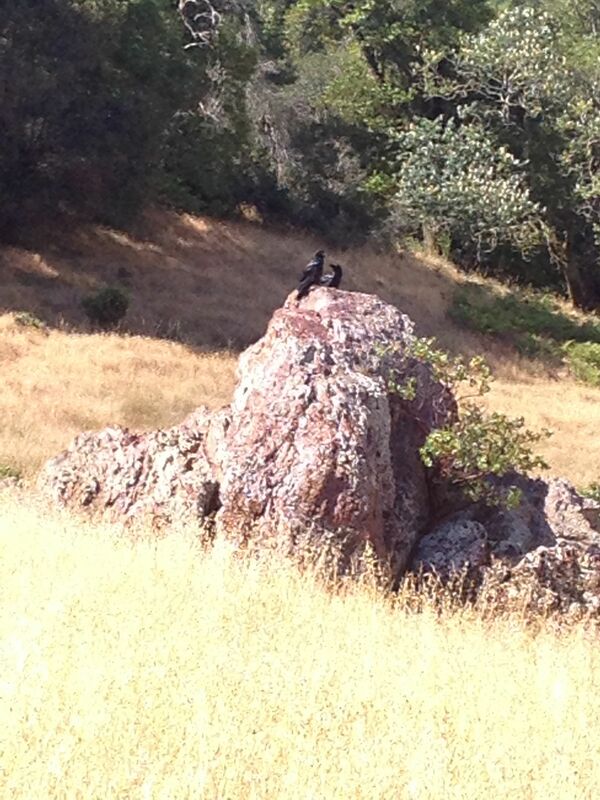 Magik didn’t notice the ravens and traipsed up to the rock. They flew off, circling above me making that wondrous “purring” sound they made earlier. Gratitude rushed over me! I sat on my usual stone chair on the Red Rock, made myself comfy, got out my aquamarine and started to sing. It was one of those moments where I felt like I stepped out of one world and into another. There was no-one around, the sky seemed electric blue, the golden dry grass sang with me, and the sun and the salamanders seemed to be celebrating, flooding me with passion. Passion for life! I sang to the forest all mottled with light. I sang to the gnomes who tend the forest, trees and shrubs. I sang to the old woman who tends the woods with such tenderness and care. I sang to them all about the pain in the world, about the violence against women and abuse of children. I sang of regrets and mistakes that I have made. I sang compassion into all the cracks and crevices of the world and my world, to people I remembered, and to those I didn’t know. I sang peaceful blue skies to the places of violence. I sang golden singing grasses to women lost in their pain. I sang raven’s purring to children crying. I sang compassion to eyes watching me. And I sang to the earth gentle as the breeze. Grass “humming”, ravens “purring”, insects “buzzing”, wind “whispering”, ancient tones “droning”. Something deep from within the forest stirred. I could hear her breath. 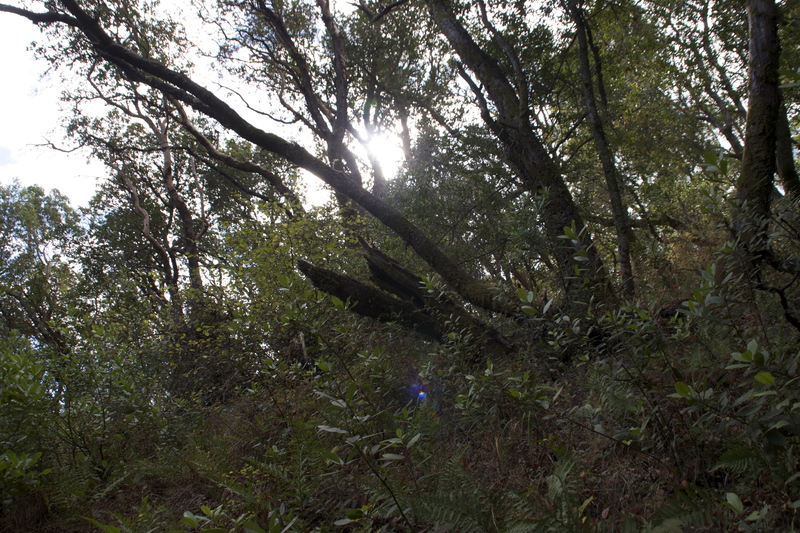 My eyes were seared shut by sunlight, but I could still see the mottled light of the forest. I could hear the flutter of her wings, born anew. Somewhere in the heart of the forest with its mottled light, new life was being born. It was a life filled with the innocence of a deer, and a heart so tender it ached as her wings unfurled and she stepped forth on the earth for the first time. I heard last fall’s leaves cracking under her bare feet. I wondered if they bled? She stepped forth undaunted by the sunlight and caught her breath, the beauty froze her for a moment. Electric blue, golden grass, red rock beauty sang to her, this creature born anew. The wind greeted her, caressed her cheek. She spread out her wings, jumped into the sky and with open arms flew! What wildness is born out of our creative play? I would have never known had I not listened to the whispers. 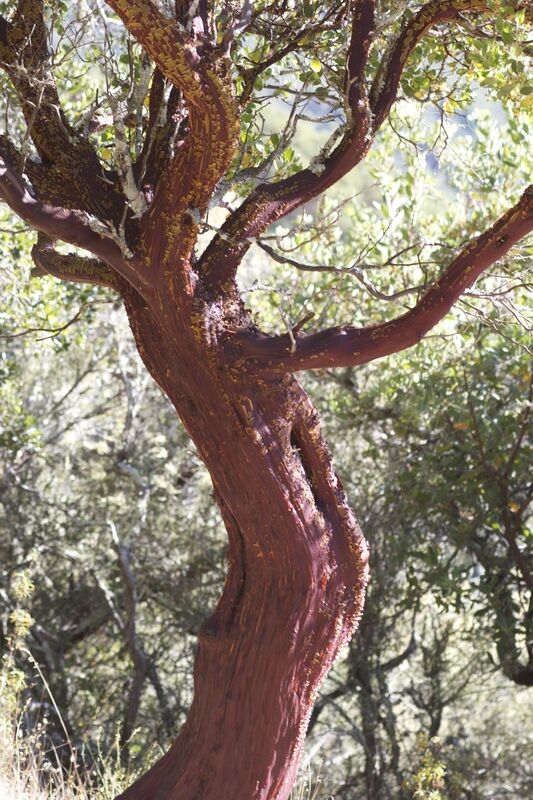 Recently, Magik and I went to visit our favorite Madrone Tree. It’s near the umbrella like Oak that creates a canopy of shade. 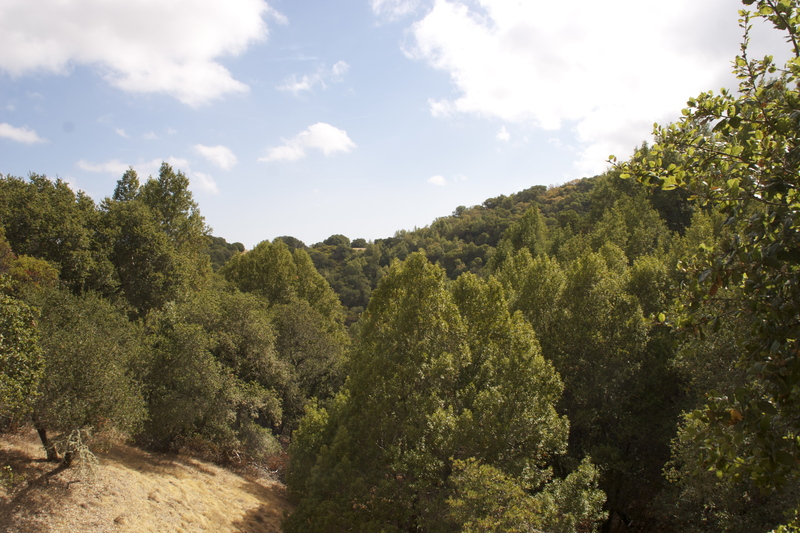 Behind it, and down the hill slightly from the Umbrella Oak is the Madrone. It’s young and vibrant, and every-time I nestle down into its roots and lean against it, the leaves dance and welcome me. Under the dappled light of Madrone leaves I sang, feeling the light and warmth, the laughter and the joy of just being out here, and reveling in the smell of pungent earth. 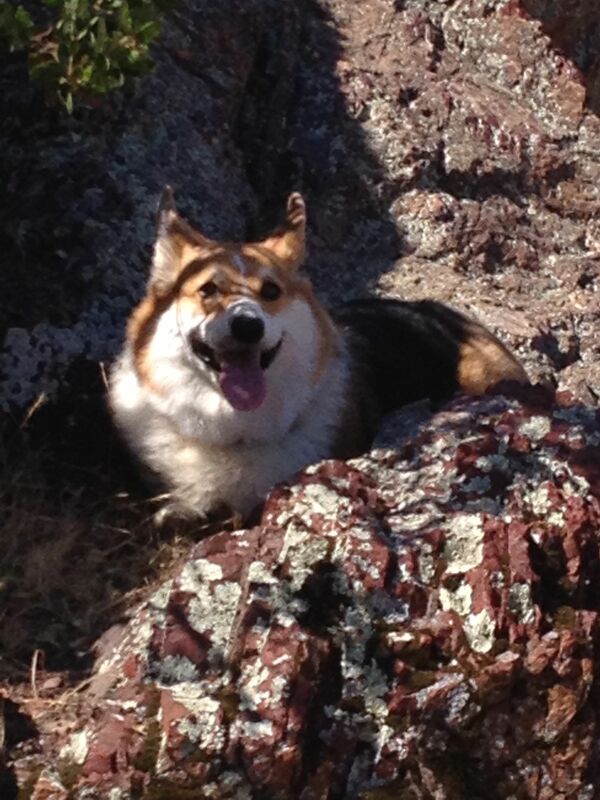 I sang until my heart was full and Magik started to growl, my faithful guard corgi. I turned to see who was there. 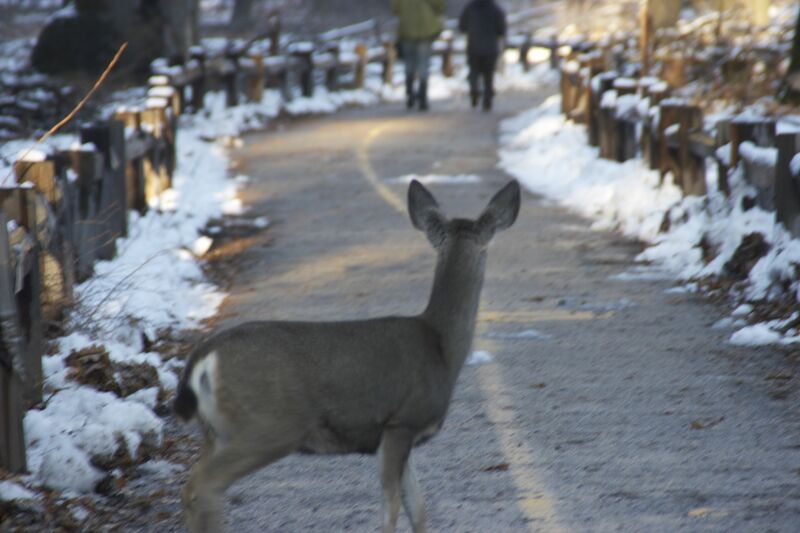 It was a deer, listening to my song. 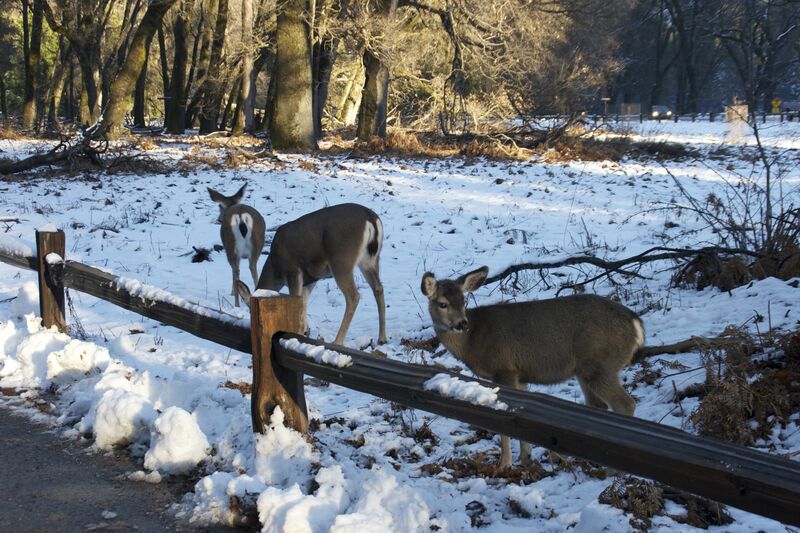 Deer often come to hear me sing, other animals too. I wonder if more of us sang in the woods, if it would draw more enchanting animal encounters. Yesterday, Magik and I went to visit my husband Theodore at his job site. 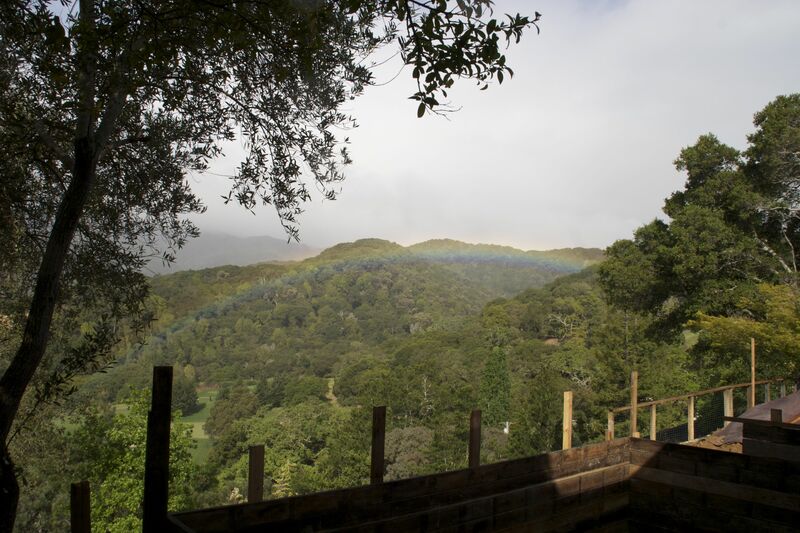 He is a general contractor and the house he is building overlooks a golf course. Throughout the building process there has been a deer family that sleeps in the yard. Yesterday was the first time I saw them, a mamma and her two babies, nestled in the foundation of where there one day will be a pool. The mother deer cleaned the older baby, the older baby licked her back, mamma and babe nuzzled, while the young one spotted me. I started to sing softly. The baby deer walked a little closer, her black eyes focused intensely on my face. I continued to sing, soft and sweet, baby deer and I held eyes for a very long time — an enchanting moment, a touch, the song luring the baby deer closer and closer. I must have lifted my voice a little louder, and the wind carried it down to the golf course, because from way down below I heard, “Hey lady, stop singing.” And then the sound of a golf ball being hit. Mental note, will have to keep the “deer songs” in the woods and not near golf courses. I stopped singing, turned to walk away, but turned and looked back. The baby deer turned and looked back too. Our eyes held for a moment. A connection was made. As we each walked in our separate directions I wondered how our lives might be different because of our touch. Magik and I went for a walk in the woods yesterday. When he starts to run around the house in circles I know it’s time for a long hike. So I chose a longer path that would work us both out. Part way through he was lagging behind and I wondered where all the energy went, but I think he just wanted to sniff and sniff some more. Eventually we made it to the top of the hill and I stopped to soak in the light, the warmth, the breeze and sing to the trees. Magik of course waited patiently. When I was done, we continued our walk, easier now because it leveled off, so again I gave more attention to the details of my surroundings. To my delight we found branches and feathers. Hands full of twig, feather and stone, hair mussed up by the wind I encountered an athlete and his golden retriever. Judging by his response to me, I must have appeared as some sort of wild woods woman. Magik and I scooted out-of-the-way, and runner and dog sprinted by. Shortly after, I found a spot where Magik and I could rest, thinking that the runner was probably a good ways away, and I could sing to my heart’s delight. I put my crystals on the ground, rose quartz, and serephanite with its beautiful earth green color, and started to sing. Some days I come into the forest with issues in mind that I want to resolve or send healing to, sometimes they are personal issues, or concerns about loved ones, and sometimes they are global issues. This day I just wanted to be with nature. I am learning that in intimate relationships sometimes we “do” things together, and sometimes we just “be” together. As he continued his run, I sat quiet, contemplating the experience, amazed that the trees and the wind had carried my voice, and that it sounded as though the forest was singing. I was quiet for a while just listening to the forest’s song, and then joined in, the two of us singing and dancing together again. Shortly after this adventure I felt as though our outing was complete. 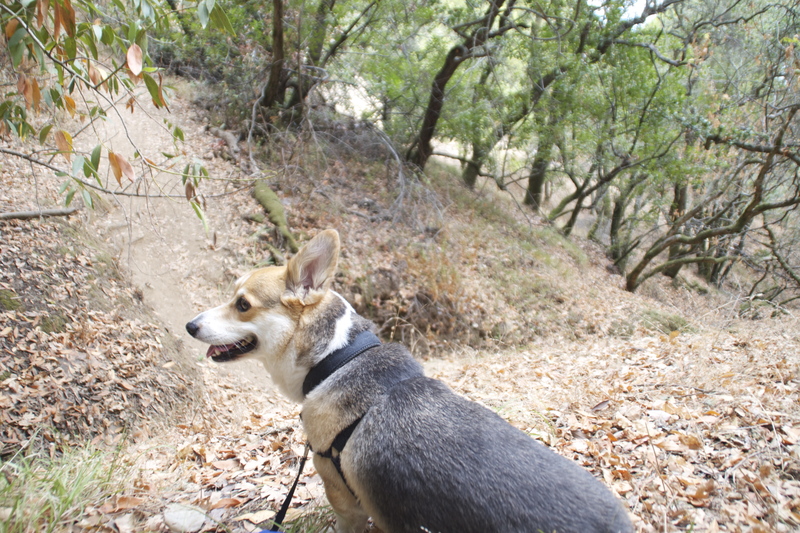 Magik and I headed back down the trail. All the while it felt as though the trees were still singing. I don’t recall ever being so aware of the Forest’s voice. What a life changing experience! I am grateful. The last few experiences I have had in nature have shown me how when I let go of my day-to-day life, suspend it, and allow myself to commune with nature that I start to see through different eyes. Recently, Magik and I went for a long walk in the woods. 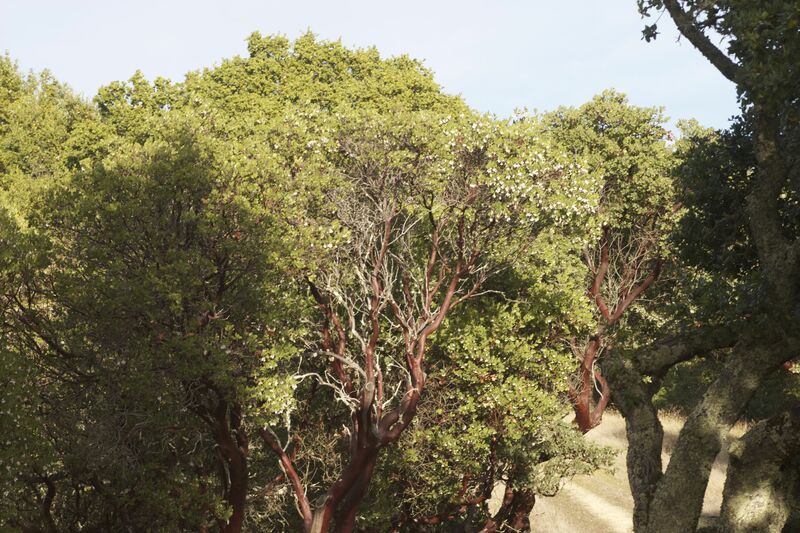 We live in Northern California, so the forest is mostly Bay Laurel’s and Oak, with patches of Madrone and Manzanita. I entered the forest with the intention that I would pay attention to detail. I entered the forest as though I was entering my own safe place, as though the entire forest was my home. As I walked, I paid close attention to the light shimmering between and on leaves, and the substance, the shadows. I listened for the voice of the forest. I touched this leaf, that rock and mentally acknowledged their beauty. I took time to walk slowly and to stop and pause, to look and listen, feel and sense. In these moments I really feel a communication between me and the forest. Again I notice when I enter the forest how the wind kicks up and the leaves quiver as though the forest is greeting me and it is such joy to receive its embrace. It fills me with reverence and I can’t help but feel the bounty of this relationship I have with nature. It is exquisite. 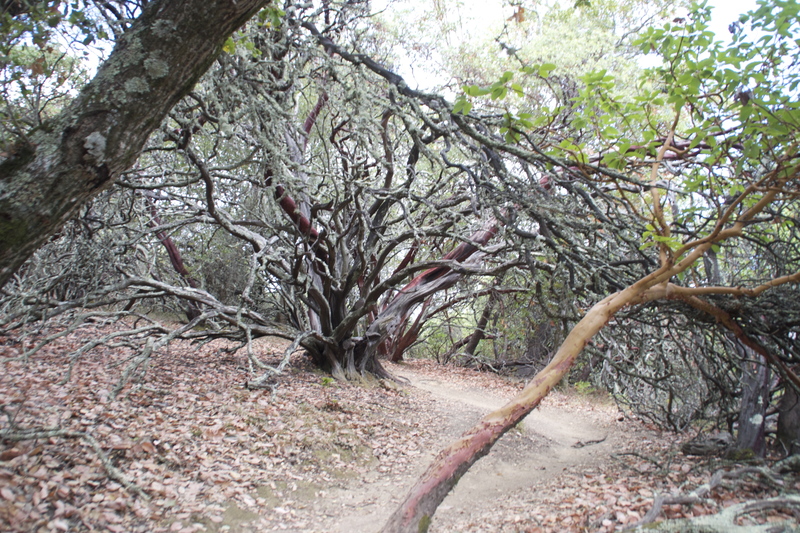 Magik and I meandered up a hill to the very top until we entered a grove of Madrone and Manzanita. They are unique trees to me. There presence is different from that of oak and bay laurel or other trees. The richness of their color speaks to me. 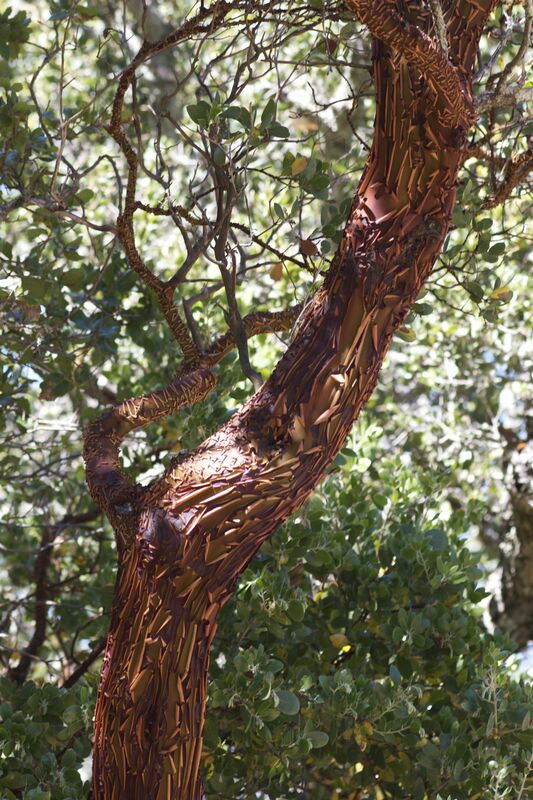 I feel a strength from Madrone and a creativity from Manzanita. 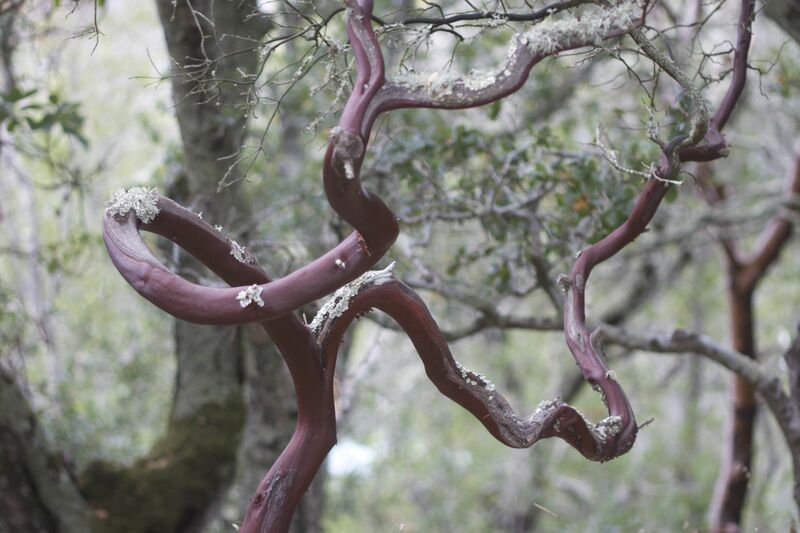 I especially enjoy the way Manzanita branches twist and dance without movement. 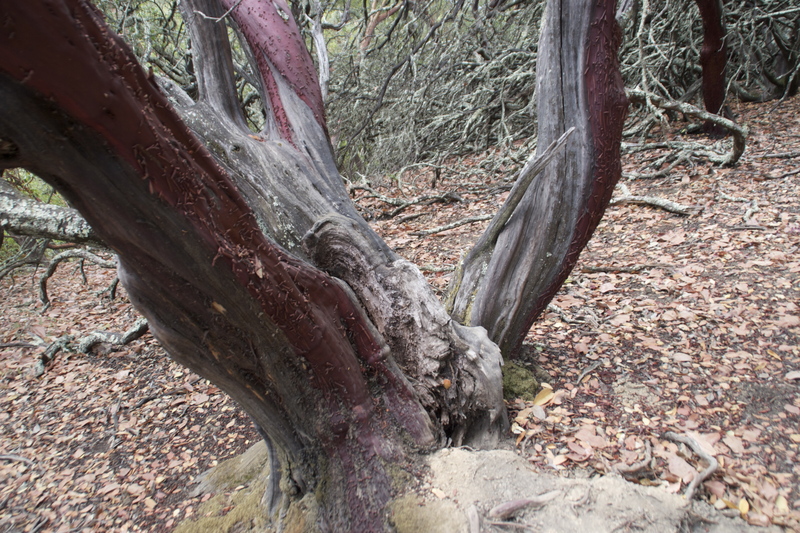 Magik and I made our way to an ancient one Grandmother Madrone. I sat with her for a while and sound healed, sang from my heart. I happened to have a rose quartz crystal with me, so we sang together. There was a gentle energy, one of healing and tenderness. From this place it was easy to let go of my daily and world concerns, and just be in this oneness with the trees and the earth. 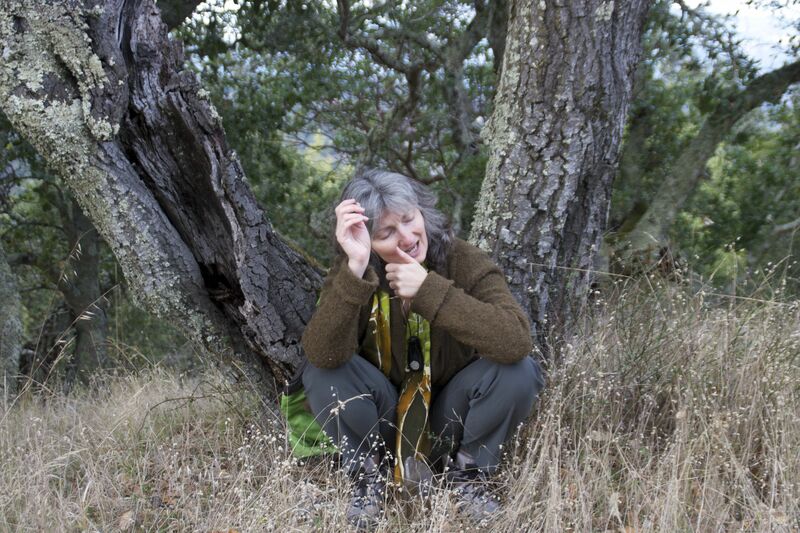 Singing with the trees transports me into a liminal place, a place between worlds, where boundaries blur and I can more than feel, I can be the oneness with the trees and the earth. When I was finished singing, on cue as always Magik begs for his treat. He is silent and reverent while I sing and connect with nature, but the minute I stop singing, he figures that’s his cue for a treat. Smile. 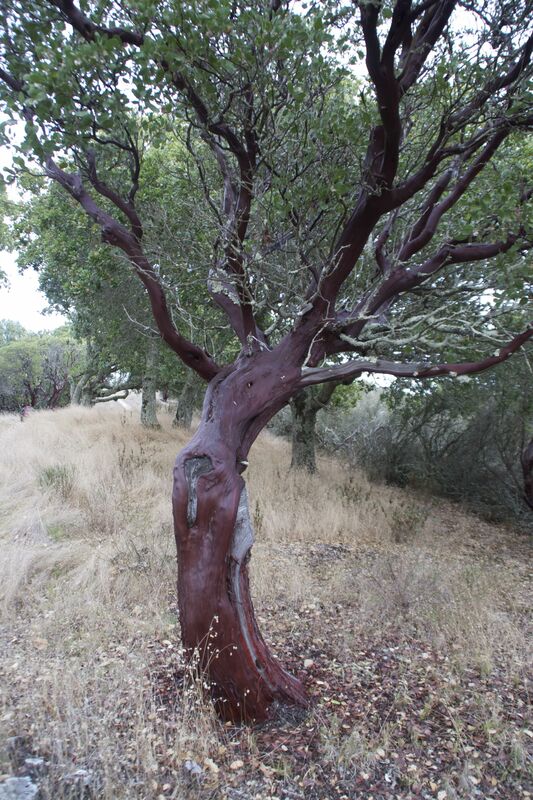 We thanked the Madrone and the Deva and nature spirits of this place and off we went heading home. It was on the walk home that I noticed I was seeing through different eyes. 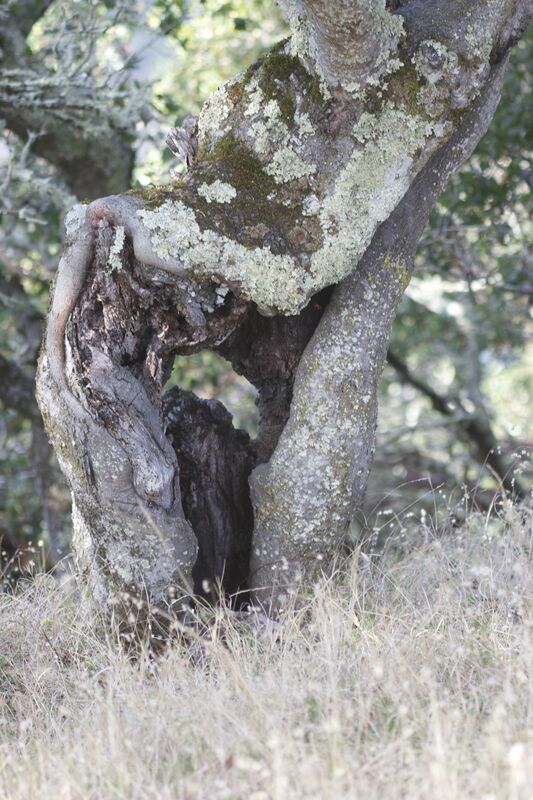 I noticed an old Oak that I had not noticed before on my walks. I stopped and touched it and connected with it, receiving some ideas for meditative work that could allow me to work through an issue I was dealing with more creatively and expansively. I thanked the Oak and its Deva, and asked for a piece of bark so that it would be easier for me to connect with the Oak meditatively when I wanted to work with it. There were many pieces on the ground so I chose one and thanked it. On the way down the hill, again we stopped. Magik and I have this understanding, sometimes his nose will take him off the path into delicious smells he wants to explore, so I will stop and wait while he explores. He does the same with me. When I feel called to connect with a tree or rock, Magik will sit and wait until I am done. Such was the case near the end of our walk. To my right I sensed something. 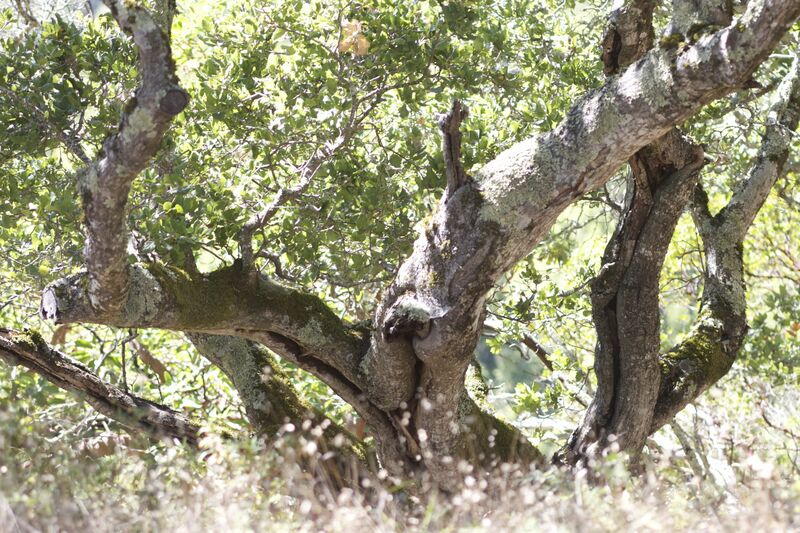 I looked at this oak tree through my renewed eyes and felt a presence. I acknowledged it and sang to it. My way of saying “I see you seeing me”. 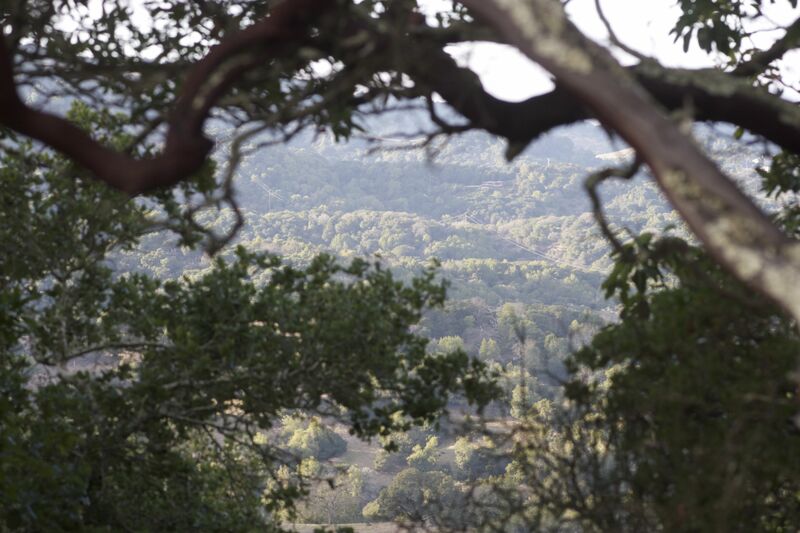 As we continued our walk to the car I pondered how singing with nature (which is my way of letting go of the “yamma-yamma” and entering that oneness with nature) allowed me to see through different eyes. I saw things that I would not normally see or sense in nature if I was preoccupied in my head. Also One-ing with nature allowed me to see the issue I was working on more clearly. What a gift! Go into a favorite spot in nature on a day when you have a lot of time, no other commitments, so that you can really let go. When you enter the forest, allow yourself to enter like you are Coming Home — as though you have been away on a trip and you have come back home, and now you are reconnecting with everything in your home. So you walk slowly with intention, paying attention to detail. You notice that spray of leaf, or the hardness of this rock, or the light and shadow of the leaves and trees. 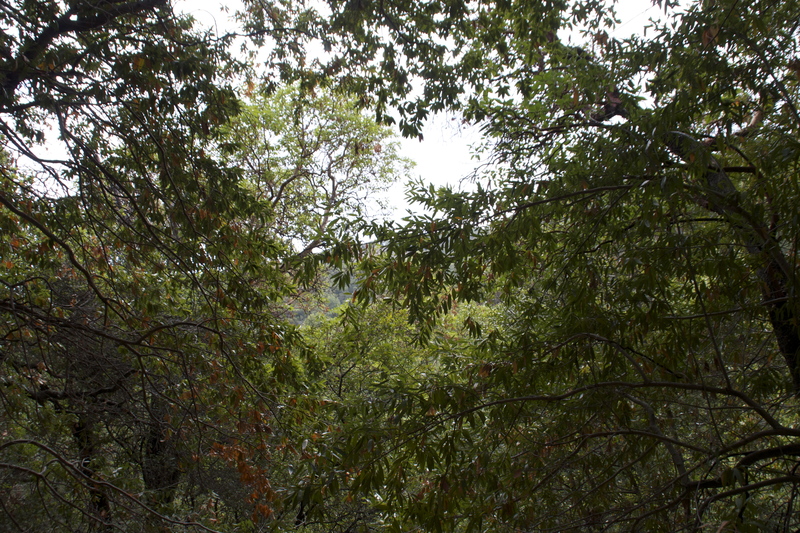 Open yourself to seeing what you normally don’t see when walking quickly through the woods. Then go to a place that is sacred or safe to you, and as you enter this place find a spot where you want to sit. Maybe it is against this tree, or on a fallen trunk, or on some moss. Find a place that feels safe and good. Then start to connect with nature. Maybe it is through breath — where you enter a meditative state through breathing. Or maybe it is through closing your eyes until they are partly shut, and you look through the haze of your lashes, allowing your focus to blur until the leaves, the trees all seem to become one haze. – Or maybe you tone or sing. For me, singing without words, from my heart and soul helps me to enter the oneness with nature. Let yourself be there for a while, you probably won’t sense time, but let yourself be there awhile. Let thoughts and feelings come and go. Maybe you have an issue or a question about your personal life, or about someone you love and care about, or maybe an issue in the world that you would like to see resolved. Bring that in and ask for clarity and guidance or insight and healing. Be creative with it. And then allow yourself to receive, knowing that you are receiving in this moment even though you may not hear the answer, know you are receiving. When you feel complete you may feel a desire to thank this place and those that helped. Please do. Nature responds to loving kindness and thankfulness. Make sure to ground with your breath, maybe touch the palm of your hand to your heart or brow or solar plexus. Breathe in and breathe out to ground more fully. As you walk back to your car, or home, give attention again to your surroundings, to this rock, this tree, this shadow, this light. Give attention when you go back into your life, for insights will surely come. It’s important for us to recognize and acknowledge them when they do show up, however subtle or profound they may be, and most of all have fun!